The mission of Hard Bargain Association is to preserve the historic Hard Bargain neighborhood by renovating existing homes, building high quality affordable housing, and enriching the lives of our neighbors. The vision of Hard Bargain Association is o transform the neighborhood into a diverse and vibrant community to be proud of for generations to come. We offer computer classes, cooking classes, and a variety of other classes and programs during the year. Also, you can rent the community center building for events and private parties. Contact info@hardbargain.org or call 615-591-0504. The Hard Bargain neighborhood was established in 1875 when Harvey McLemore, a freed slave, subdivided 15 acres which he purchased from his former owner, Judge W.S. McLemore. He later subdivided the the property and began selling lots to other freed slaves. Hard Bargain became a thriving African American community. The neighborhood is located on 15 acres, two square city blocks in downtown Franklin and totals over 130 households. There are many families in the neighborhood today whose roots go back several generations. Pastor Scott and Linda Roley moved into the Hard Bargain neighborhood in November 1997. They purchased a home across the street from Carrie Wilson, a retired Williamson County school teacher. Ms. Carrie’s house was in need of major repairs. Scott shared the need with the Empty Hands Fellowship, an inter-denominational, inter-racial men’s fellowship, and the group decided to get involved. Ms. Carrie’s house was facing foreclosure, so the Empty Hands Fellowship put down $20,000 to pay off her loan and spent $10,000 fixing up her house. Meanwhile, Ms. Carrie moved to Alabama with her niece where she later died. The Empty Hands Fellowship decided to turn Ms. Carrie’s house into transitional housing for single mothers moving out of public housing. A single mother and her three children moved in along with her mother and younger brother. The house continued to need repairs and after a while, a decision was made to tear the house down. At that point the plan of building a new house to help one family grew into a vision of helping restore and redevelop the neighborhood and provide affordable housing. The seed of Hard Bargain Mt. Hope Redevelopment was planted. A subcommittee of Empty Hands Fellowship began meeting monthly at First Missionary Baptist Church to talk about redevelopment of the neighborhood, purchasing property, and building new homes in Franklin’s vanishing population of homes priced for low to moderate income working families. A Community Development Corporation was formed in 2004 and in March 2006 Hard Bargain Mt. Hope Redevelopment obtained its 501(c)(3) non-profit status. A board of directors was elected and an advisory board continued to meet monthly. Over time, three properties were acquired on Mt. Hope Street and one on Green Street. Brant Bousquet, HBA’s Executive Director and first employee, was hired in May 2007. Office space was donated in downtown Franklin by a generous donor. Having a full-time employee enabled HBA to continue to grow and do various repair and beautification projects in the neighborhood. Ashley Pope, Administrative Assistant and Volunteer Coordinator, HBA’s second employee, was hired in February 2009. The second house at 952 Green Street was also built by Crane Builders. Over 100 Hard Bargain residents, community leaders and family and friends of the homebuyer attended the ribbon cutting on November 8, 2008. The third house at 727 Mt. Hope Street was finished in October 2010. 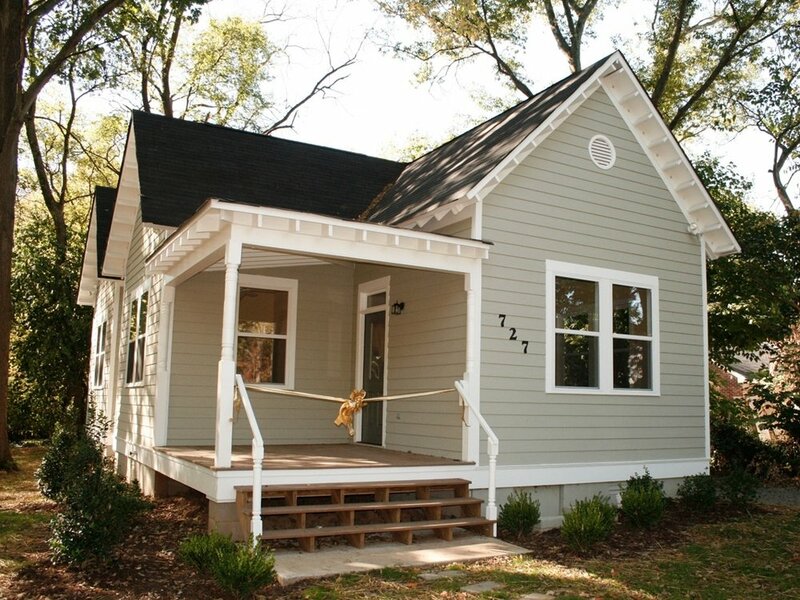 The fourth house, a 2 bedroom/1 bath cottage at 956 Green Street, was completed in March 2011. In June of 2011, an early morning fire destroyed the home of Big John Murphy, a life-long resident of Hard Bargain and HBA board member. His insurance policy had lapsed following the company’s bankruptcy. Volunteers and donors from all walks of life in Williamson County worked together to raise the money for Big John’s new home, our fifth house to build. He moved into his new home in April 2012. HBA build its sixth home at 709 Mt. Hope Street for Derrick and Marquita Solomon, and their son. Marquita is the granddaughter of Rev. Denny Denson, one of the founders of HBA. The seventh home at 363 9th Ave. North was completed in October 2013. The ribbon cutting for the eighth house at 361 9th Ave. North took place in October 2014. In December 2013, HBA’s Planned Unit Development on Mt. Hope Street was approved for higher density so 5 new houses can be built on this property. The infrastructure was completed in early 2016. 2 of the 5 homes are currently under construction, leaving 3 lots left to sell and build new homes. In June 2009, HBA launched a Rehab Program, repairing the homes of elderly and low-income residents in Hard Bargain. Materials and building supplies are donated or purchased through financial contributions. Volunteers provide the labor and work under the direction of Joe McCallum, HBA’s Rehab Coordinator. Through HBA’s Beautification Program, an organic community garden was started in 2008 on Glass Street. Two neighbors living next to the garden oversee and maintain it. Volunteers and members of the American Legion Post 215 have given the building on 9th Avenue a complete “home makeover.” Additionally, volunteers have done repairs at Franklin Primitive Baptist Church on Mt. Hope Street, where we hold our neighborhood meetings. Other beautification projects include planting flowers, landscaping, and doing yard clean up in the neighborhood. For years the residents of the Hard Bargain neighborhood have wanted a community center. This dream became a reality thanks to Solomon Builders of Nashville and the Ty2 Foundation. Along with many of their subcontractors, suppliers and vendors, Solomon Builders helped renovate the former cemetery caretaker’s house in the Mt. Hope cemetery. On Saturday, August 11, 2012, over 400 volunteers showed up for “Ty Us 2Gether @ Mt. Hope,” a day of service in memory of Ty Osman, Jr. who was killed in a tragic car accident in March 2012. The community center, named Ty’s House, offers classes, events, and an Internet Café where children and adults can have access to computers and the internet. Various educational and training programs take place throughout the year, and the community can be rented for events and private parties. Hard Bargain Association has a fourteen member Board of Directors that meets monthly. Board members are selected from the Hard Bargain neighborhood and from the community at large. Care is taken to insure that at least one third of the Board is low to moderate income or a representative from the neighborhood to maintain Community Housing Development Organization status with the U.S. Department of Housing and Urban Development.